With so many brands and sets of watercolor pencils for artists on the market, choosing the best set can be confusing. 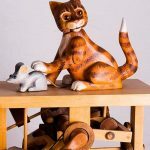 If you are serious about your art and crafting you will be looking for ‘qualities’ as the key factor. I say qaulities as there are several that I look for. Vibrancy of color is really important especially for my cartoon work. The pencils should apply smoothly to the work surface and it is also very important for the wood to sharpen without splintering. One of the most important facets is how the pigment mixes with water and subsequent appearance when dry. I also consider the range of colors and value for money. Quite a list to consider! 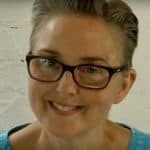 I have selected five pencil sets based upon my own personal experience while using them and on the reviews of previous customers. You will notice that all five sets are by well known brands. That is for a reason – they are quality products that have stood the test on time by manufacturers who know what artists need and want. They also posses the qualities I look for. 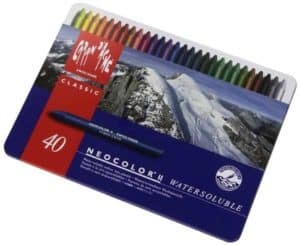 This is a brilliant set of watercolor pencils for a beginner. They provide really intense colors when applied wet or dry with deep hues. I like the smooth way in which the leads draw on paper and pigments blend together. On the down side they do seem to take a little longer to dry than other watercolor pencils. However this is a minor niggle that just needs a bit of patience. 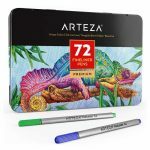 The sets come in various sizes generally 12 to 72 pencils and there are often great offers with deep discounts to be found on Amazon. 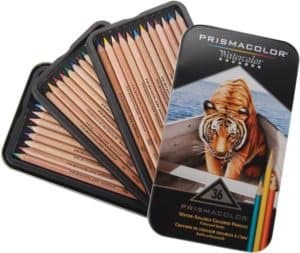 Prisamcolor watercolor pencils are a top qaulity brand and I always have them in my studio. For me they consistently deliver vibrant bold colors, wet and dry, which is ideal for my line of cartoon art. The leads are soft and smooth and apply really well on the work surface giving fine detail and smooth shading with ease. 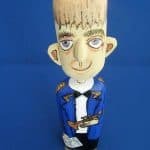 They are very easy to blend and suit well to a variety of shading techniques which is particularly useful for cartooning. The 36 set is about right for general use as it provides a really nice selection of color. 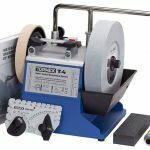 Personally I have never had any issues with the outer wood casing splintering during sharpening. However there are a very small number of customers who found this to me a slight problem. All in all this pencil set is a class act! This is a wonderful set of watercolor pencils providing a greta range of color. This is ideal for the professional artist giving a broad spectum of pigments to work with. 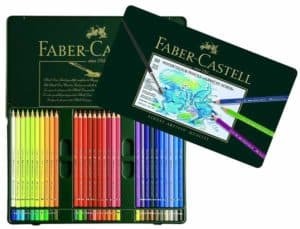 For me they have the edge on other watercolor pencil brands as Faber-Castell somehow manage to produce the richest pigments. Really bright, intense and perfect for my artwork. The pencils apply color as smooth as silk and blend and mix superbly. I have been using Faber-Castell for as long as I can remember and I really have no critisism to offer. I have included another Faber-Castell set due to it’s ergonimic grip. The barrels have a smooth triangular shape which is really comfortable in hand. Any artist will know the cramped and uncomfortable feeling you get when working for prolonged sessions. The Art Grip Aquerrelle is so comfotable that you forget its there letting you draw and paint distraction free. The leads and wooden barrel have all the first class qaulities mentioned in the previous set and a 36 set gives a good range of color. Larger sets available would work better for the professional artist giving more scope for color variation. As with the previous Faber-Castell Albrecht Dürer set there is nothing but praise. The Caran d’Anch Watercolor Pastels are another excellent watercolor alternative to the traditional brush and water. They provide high quality pigment and maintain their original color when wet. The pigments tend to get more intense when water is added. They are really easy to handle. lay down the pigment smoothly with a nice creamy pastel texture. I have tried these a few times but they dont suit my style of art. For me they do not provide the level of sharp and accurate line that I require. however, this my own personal taste and for general crafting work they are an excellent product. Which are the best water colour pencils for Crafters and artists? 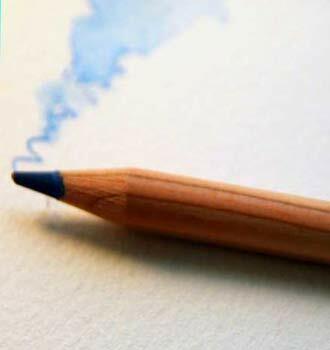 They are at the highest level of quality in the watercolor pencil market and will all do a fantastic job. 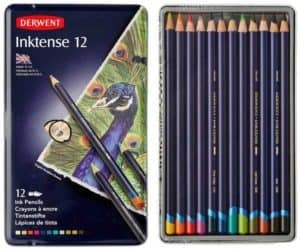 If you are looking for a smaller set the Derwent Inktense watercolor 12 pencil set is a very good set for general use. My personal favourite is the Faber-Castell Albrecht Dürer Watercolor 60 Pencil set which is in a class of its own. Because I am constantly using all types of medium I need a larger set and one I can totally rely on. Faber-Castell provides that comfort blanket that lets me do my work without having any worries about color issues or quality. It will also depend on which craft you use watercolor pencils for as different sets and brands may suit your style of art better. 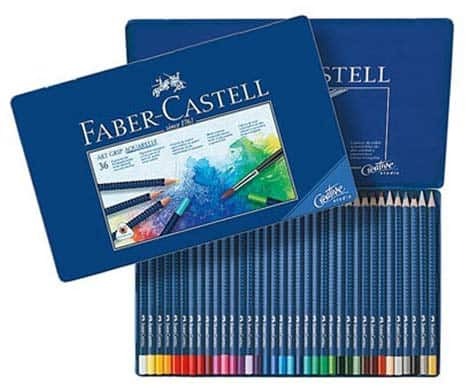 Whether it’s Caran d’Anche, Faber Castell or Derwent you will be getting great value. 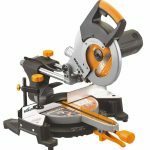 Hopefully this review has given you some ideas to give your craft work the edge.